You’re short on cash or just can’t wait to purchase a product you’ve wanted for a long time or pay down some debt and you just received you last paycheck for the year. The sooner you file your tax returns, the sooner you can expect your return and put that money to work. 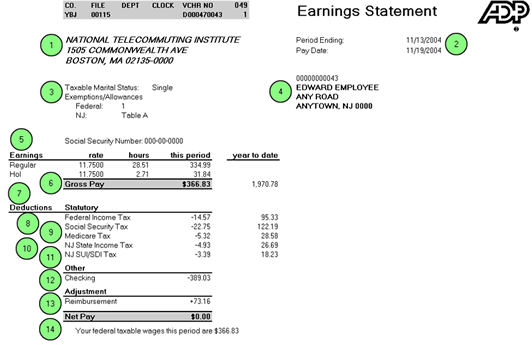 There’s only one problem, once your employer starts preparing W-2s there might still be some adjustments and it’s quite possible that information on your last pay stub will not match what’s on your W-2 (also potential accounting error on a pay stub can be later corrected for W-2; distribution of retirement contributions might not be clear or included at all on the pay stub). No matter how much you want to get the tax returns out of your way, the IRS still favors information on the W-2. But getting back on topic, can you file taxes with your last pay stub? In a nutshell, Yes and No. Your employer is required to give you your W-2 by January 31st, that’s only 4 weeks later if you decided to do your taxes on the earliest possible date (January 1st) based on the last pay stub. It’s understandable that sometimes money is tight and necessary immediately but I suggest having a plan B for those circumstances and not considering the idea of using your pay stub as a basis for filing your taxes. Your employer sends the same information to the IRS, therefore it can be easily compared and verified. In case of any discrepancies, the IRS might put your return on hold and request explanation and perhaps amendments to your return. Once that happens it is hard to estimate how long it might take before the IRS releases your refund, but I would guess that much longer than the 4 weeks had you waited for your W-2. Even though you are required to file your taxes with a W-2 form that’s not always possible. Let’s now consider a plausible scenario, one where you lost or never received your W-2 form. Considering the fact that the IRS has a special form just for that purpose makes me believe it happens plenty often. Form 4852 is a substitute for Form W-2, Wage and Tax Statement. It serves the same function for Form 1099-R.
Before you even get started with Form 4852 you have to make an effort to try to obtain a copy of your W-2. You can also contact the IRS (after February 14th) and they will get in touch with your employer for you. This is not only because you have to explain your efforts to get it on Form 4852 but also because it is your responsibility to fill out the form correctly. It will serve as a base to present your 1040 form. Wage, tips, and other compensation. As you can see there is a lot of information required. Perhaps all of it can be found on the pay stub or similar statement, but in case some of it is not available, you either have to estimate or try to retrieve it contacting the accounting department of your employer. Both you and your employer have responsibilities regarding Form W-2. Sometimes letters get lost in the mail but eventually make their way to the final recipient. In case you received your W-2 after you had filed the tax returns, you have to file a Form 1040X. This Amended U.S. Individual Income Tax Return is a required document by the IRS in case you discover that discrepancies exist between the W-2 you received and Form 4852 you filed. In summary, worst comes to worst you can file your tax returns with your last pay stub. You should avoid it though and make sure you receive and keep your W-2 Form secure.